Although most states and societies have managed to adapt to recent environmental changes, there is no guarantee that this will continue. This is the question I sought to address in remarks at a recent conference organized by the Peace Research Institute of Oslo (PRIO), which accompanied the public event at the Wilson Center I blogged about several weeks ago. Here are my thoughts on bridging the policy-academic divide on climate and security, which represents a distillation of the wider theme I explored in the latest issue of the Texas National Security Review. It is very hard for us to do signposting for policymakers about what our sometimes ambiguous findings mean for policy, but I think we could see some portents for how to make our work policy relevant. For example, Nina von Uexkull and colleagues have a 2016 PNAS piece that showed conflict risk potential was greatest in places that were highly dependent on agriculture, in areas of high political exclusion, and where growing season rainfall declined precipitously. 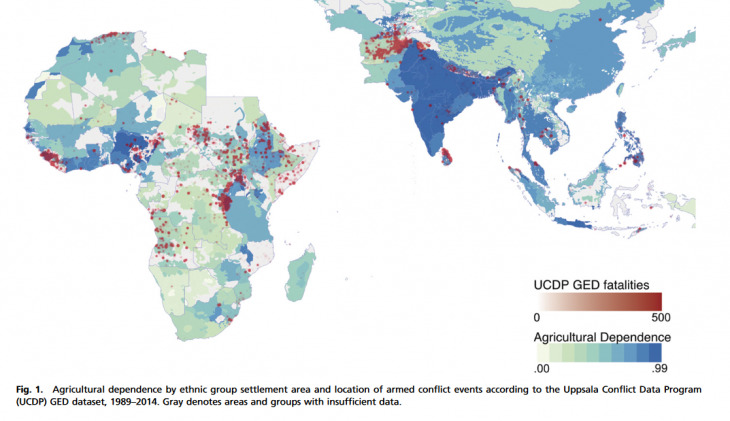 Conflict risk potential was greatest in places that were highly dependent on agriculture, in areas of high political exclusion, and where growing season rainfall declined precipitously. We should seek to further test those findings with out of sample predictions, but then I could imagine an early warning network to be incorporated in or alongside FEWSNET to flag those chronically vulnerable areas of high agricultural dependency and exclusion alongside those seasonal shocks in rainfall. Let’s say we did have an early warning system for climate-related conflict, that would only be a beginning. Policymakers often want to know about particular places so we may need to make a more earnest effort to specify how our arguments travel from the general to the specific. So, in general, if we say that agricultural dependent countries with high political exclusion are vulnerable to rainy season shocks, what are the candidates that emerge from that analysis as high risk? Where are the low risk places? Can we write narratives of political exclusion and the intersection with climate risks for particular countries? For example, take the recent Oromo people’s unrest in Ethiopia that erupted in the wake of the 2015 drought. 80% of Ethiopians still rely on agriculture for their livelihoods so from a structural perspective, Ethiopia is a good candidate for potential weather-induced unrest. If you look at the latest Ethnic Power Relations score for Ethiopia from 2014, the Oromo were counted as “junior partners” in terms of political representation, but it’s pretty clear from the recent movement that there was a feeling of political exclusion in practice. Despite accounting for 36% of the population in Ethiopia, the Oromo have felt marginalized from the seat of power which until recently was being run largely by Tigrayans who account for 6% of the population. In 2015, the belg season rains, which normally fall between February and May, were late. The kiremt rains that normally account for about 50-80% of annual rainfall from June-September were late, volatile, and far below normal. The drought was caused by an especially intense El Niño, though it may be difficult to establish an anthropogenic climate change link. Needless to say, it was an especially severe and extremely rare drought, occurring “only about once every few hundred years” and affected the food security of some 20 million Ethiopians, about a fifth of the population . Despite the Ethiopian state’s improved ability to prevent famine compared to say the 1980s, the government still faced widespread social discontent in the wake of the drought. The drought stretched the ability of the regime to cope and perhaps diminished its capacity to prevent discontented groups from mobilizing. Oromo protests really took off after November 2015. ACLED data from 2014 show when a student movement began and the progression over time. A flashpoint for Oromo mobilization has been the expansion of Addis Ababa, where a 2014 master plan was set to displace more Oromo from their ancestral lands. The Oromo claimed that 150,000 had already been evicted over the previous decade. Oromo mobilization triggered a crackdown on the protesters and a state of emergency, with the violence claiming as many as 1200 lives. Other ethnic groups such as the Amhara joined the protests. With more widespread violence a possibility, the Ethiopian government shelved the Addis the master plan in January 2016. However, protests continued, ultimately culminating in the resignation of the prime minister in February 2018. Tensions now may be alleviated as Ethiopia just installed in April a new prime minister from the Oromo people, though we’ll have to watch for favoritism and friction with the Tigrayans going forward. By pairing cases with different outcomes, we can isolate the conditions under which climate exposure leads to bad security outcomes in some places but not others. I think an analytically informed narrative like this one about particular places could be quite useful for policy if we take what we know in general and try to apply it to particular places. It’s also vitally important to ground truth these cases with regional experts. I ran this Oromo sketch by Clionadh Raleigh who said the recent Oromo unrest had everything to do with Addis expansion rather than the drought, though I think the timing in the wake of the drought is potentially important. For this case, I would want additional detail assessing and exploring the links between the drought and the protests. Early warning systems don’t tell policymakers much about what to do. On the disaster side of things, we have an established practice for how to prevent famine including pre-positioning of aid, cash support systems, and other measures, all of which Ethiopia deployed to some success in 2015 despite the severity of the drought. However, on the conflict side, we need some more empirics on what kinds of peace-building institutions, practices, and projects tend to dampen the risk of conflict. We have some general findings on regime type and some more specific ideas about institutional configurations in the transboundary water space, but we don’t really know what institutional configurations can prevent conflict, particularly resource or climate related conflicts. I think we have to do more than say development is the best tonic for conflict, as we have 70 years of development practice, with a foreign aid industry that continues to struggle to identify what kinds of approaches are most successful. There are some tantalizing portents from randomized control trials that have become quite common in development, though I am suspicious of project level interventions in the absence of national government institutional change or for transboundary resource issues, regional resource management institutions. That said, I think we have to try to develop some more standard rules of thumb for what interventions dampen the risk of conflict like we have for transboundary water management, institutions that do dispute resolution, that allocate flows, that have plans in place for shocks, etc. What kinds of investments work best? Is there a proper sequencing? While some of this may be a bit of a stretch for us, I am inclined to believe that where we have some more confidence in the clarity of our findings, we can draw important lessons for policy, but we need to do a better job translating our work in ways that are useful for decision-makers. This is a crosspost from the Duck of Minerva.